Today's CityPlus section of the Edmonton Journal had a couple big front page stories (I don't count Paula Simmmons ramblings as a big story, even though it is a half-assed pro-Conservative article from her -- the biggest sign yet that a possible Conservative government is a bad idea) that are somewhat interconnected. Rely on me, oh faithful readers, to spot this connections nobody else catches. Last time it was the curious correlation between handguns and daycares, and now its that you're more likely to be murdered near the LRT. Say what? Well, first let me backtrack: the bottom story is about the new Health Sciences LRT station (why Edmonton Transit can't call it the "University Hospital" station is beyond me -- heaven forbid a tourist should know that's where the LRT-linked hospital is). I rode the new "lert" line on Monday when it was free, and let me tell you: $109 million dollars just got thrown away. Its a freaking 40 second journey from University station to Health Sciences station, or as the Journal described it: "several hundred metres" away. So anything over 200 is "several hundred metres?" This is another repeat of the downtown LRT fiasco: there are three stations (Corona, Bay, Central) that are so close to each other you can make out individual people at the stop further down from the one you are standing at. Add in two more stations (Grandin and Churchill) that are almost as close, and only invisible because of a curve in the track. They do this, and then wonder why we're so freaking obese??? Now all they have to do is build it farther south, and... what's this.. there's a building in the way (its located behind the trees in this picture and literally only a hundred metres or so from the edge of the track)! Ahh, Edmonton's LRT planning is complete: "lets build it from downtown to the far northeast edge of town where nothing is, just because that's where the rail lines already are running" - "lets build it only on the north side of the river" - "lets build a southside station at the UofA, but bury it four stories underground" - "whyte avenue? west edmonton mall? mill woods? nah, lets extend it to a mall that doesn't exist anymore" - "there, now the train is above ground, lets aim it at a historic building". This list doesn't include 2 other murders near the 3rd murder: the 10th and 7th were up by Victoria Trail and far enough away from the LRT to be ignored. The list also fails to note another hot spot: the 5th murder of the year happened at Orlando's 2 Pub and Grill, while the 31st murder of the year was an 18 year old girl killed when walking home from her birthday at Orlando's 2. Orlandos first location seems to have escaped the curse: the nearest murder was at 111th ave and 153rd street some 12-13 blocks away. So what can we learn from this? Living near the LRT is murder: most of the near-LRT victims were attacked at or near their homes. Also, summer is a bad time to live between Central and Belvedere stations: from May 2nd to September 23rd 9 of Edmonton's 37 murders occured in that region. As comparison, Mill Hoods only had 6 murders throughout the year, 4 of them between Whitemud and 34th Ave and between 17th and 50th Street. (Ellerslie-23rd and 34th-50th was the rectangle with the remaining 2). The two Orlandos victims were part of the other big regional clump: 5 murders between 134th and 167th Ave from Castledowns Road to 127th Street, with a 6th murder at Yellowhead and 128th Ave.
And now the LRT is expanding south? Dear Lord, the murder rate is only going to get worse! 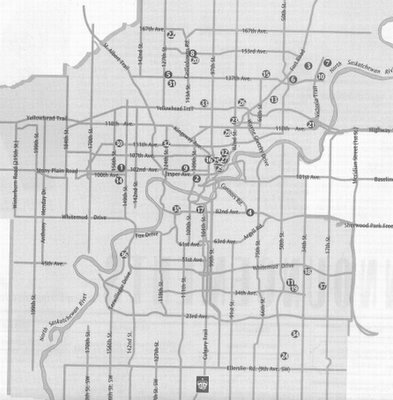 After way too much delay, here it is: a poor scan of the Edmonton Journal map of the murders. At the moment there's no line showing the LRT tracks...my computer woes mean no good image editors. But if you want to look at a map showing the LRT line, check the Edmonton Transit website (Currently down). 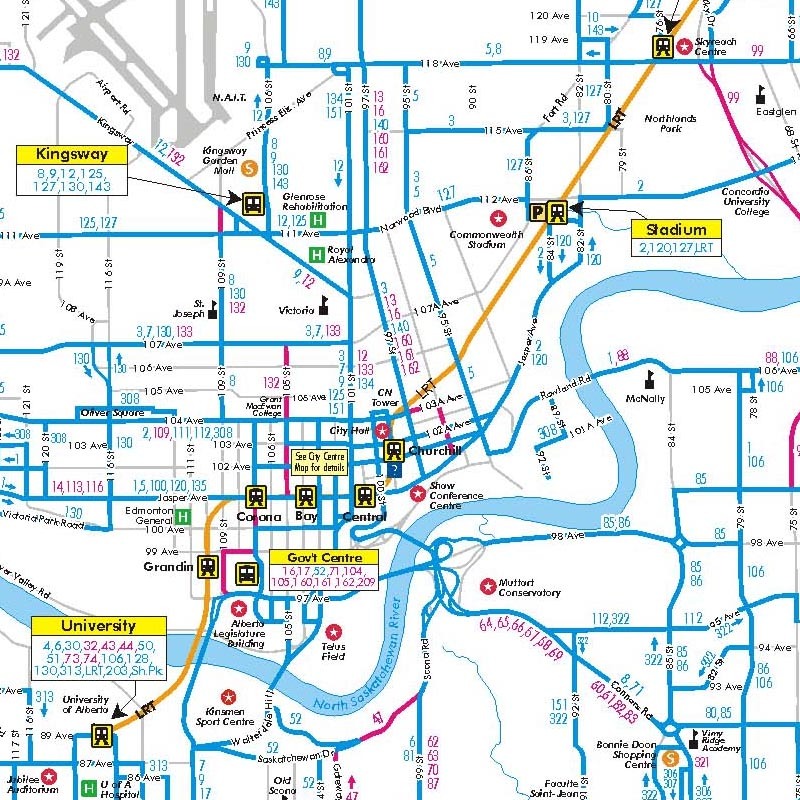 This map might also be of some use, but you would have to overlay it on the map of Edmonton in your head. This cutaway of the downtown LRT section will also help in your quest.